Mar - 21 | By: zikri | 1 comment. The most awesome and untouched island from West Sumatra, Indonesia, where located on the south coast area. Its white sand and blue clear water bring the calm feeling and makes grateful thought toward the hard days in life. For those who seek serenity and the beauty of nature, Pagang is the answer. The attractiveness of the island brought it to a deserve phrase – a paradise island, but still few people visit it because this place is not well published. This breathtaking place is a dream island as well for water sport lovers. 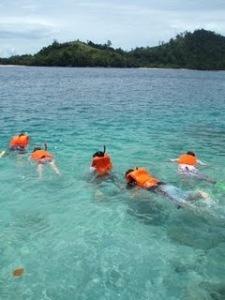 Clear blue sea water ever and amazing coral reef sites with variant colorful fish species. There is available a local resort assist for personal or groups to do the water sports such as diving, sea fishing, snorkeling, and other excitement activities; parasailing and banana boat. Padang as the capital city of West Sumatra is the first point to be reached. After arrived in the city, rent a car to Bungus Beach. At this point, rent a boat to Pagang Island. If the started point from Minangkabau – West Sumatra, It is around one hour drive from Minangkabau airport. Rent a taxi to go to Bungus if you stay in a hotel near the beach. If staying in a hotel in the city, take a taxi to Bungus, but it’s costly. Arrived at Bungus Beach, rent the boat to the Pagang Island, its around 150 thousand rupiah. By public transportation; get on ELF Car (shared taxi) from Pasar Raya Padang or near Pasar Raya Plaza. The fare is around five thousand rupiah. It just takes around sixty minutes. It is quite cheap. On the way to Bungus Beach, wonderful scenery will accompany visitors along the trip. The car will pass trough hills with the beach under them, welcoming the visitors. There are also small and cute monkeys in the side of the hills. Many people sometimes stop by just to give peanuts or bananas to the monkeys while taking pictures. Arrived at Bungus beach, rent the boat to the Pagang Island.